The real story involved more monsters. And a lot more time travel. It’s 1815, and Wellington’s badly-outnumbered army stares across the field of Waterloo at Napoleon’s forces. Desperate to hold until reinforcements arrive, Wellington calls upon a race of monsters created by a mad Genevese scientist 25 years before. It’s 1815, and a discontented young lady sitting in a rose garden receives a mysterious gift: a pocket watch that, when opened, displays scenes from all eras of history. Past…and future. 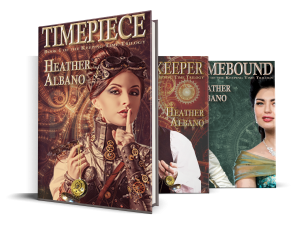 It’s 1885, and a small band of resistance fighters are resorting to increasingly extreme methods in their efforts to overthrow a steampunk Empire whose clockwork gears are slick with its subjects’ blood. Oh, come now. That would be telling. Interested in fiction that will bend your mind and heart? Sign up for news, giveaways, and more!